India's one of the most famous auto-mobile giants, 'Maruti Suzuki India Private Limited', ready to launch its multi utility vehicle, Maruti Ertiga with the new engine option, that is CNG engine. But the CNG is offered with only two variants such as LXi and VXi models. The company is known for their less maintenance and reasonable price vehicle. Before Maruti Ertiga, SX4 model is only car which is launched with all three engine options by the same stables. As we discussed that the company is known for their reasonable price range, Maruti Ertiga price is Rs. 5.98 lakh to Rs. 8.70 lakh (Ex-Showroom, New Delhi), which can be easily afforded by the middle class as well. The CNG would cost approximately Rs. 30,000 more than the base variant. Both the variants that is diesel and petrol consist of 1.3-litre and 1.4-litre engine respectively and 4 cylinders. The petrol engine of the MPV is with a displacement of 1373 cc and generates the power of 93.7bhp with the maximum torque of 130Nm. On the other hand, multi-jet turbo diesel engine is with a displacement of 1248cc and the power generated by it is 88.7bhp with the maximum torque of 202.2Nm. Both the engines have a five speed manual transmission gear box. The Maruti cars used in their vehicle is K-series refined engine which are not only better in fuel economy but also emits low Co2 in the air and save environment. The list of Maruti Ertiga features include its exterior measurement and interior comfort. Wheels of the MPV is situated on the extreme ends of the vehicle, which makes the ride smooth for passengers and safe for drivers. The 15 inches of alloy wheels and 185mm of impressive ground clearance gives the entire vehicle a sporty look. The tie size of the wheel is 185/65. Apart from these, Ertiga is integrated with ABS (anti lock braking system) along with EBD (electronic brake force distribution) and brake assist, standard power steering and many more safety equipments to protect the occupants. The vehicle is gifted with some other features for entertainment such as an advanced audio unit with FM, AM, and radio, USB port,CD player and six speakers. 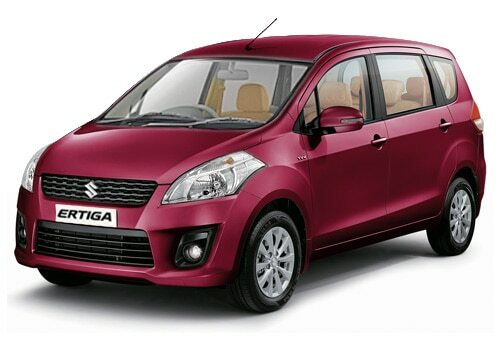 As far as Maruti Ertiga pictures are concerned, it is available on different sites and in those pictures the MPV looks stunning and its also better than other MVP cars that are available in market.The MPV is available in various exterior paint options for the customers to chose from. In short, it is a wonderful car with a lot of features at reasonable price.